One of the loveliest scents of spring comes from hyacinths in blooms. Even at a distance, you'll notice these flowers' intense fragrance and spikes of bright colors. Hyacinths are in the lily family, and if you look closely at the individual flowers you'll see the familiar tubular shape. Dutch bulb growers have been breeding hyacinths since the 17th century, and there are thousands of varieties to choose from. Modern hyacinth are among the easiest to grow spring bulbs. Hyacinth bulbs are also easy to plant or force in pots. The large bulbs and sturdy stems are also wonderful grown in water, in a bulb vase—no soil required. Mature Size: 6 to 12 inches tall and 4 to 9 inches wide. For the strongest and farthest-reaching scent, grow hyacinth in large blocks. 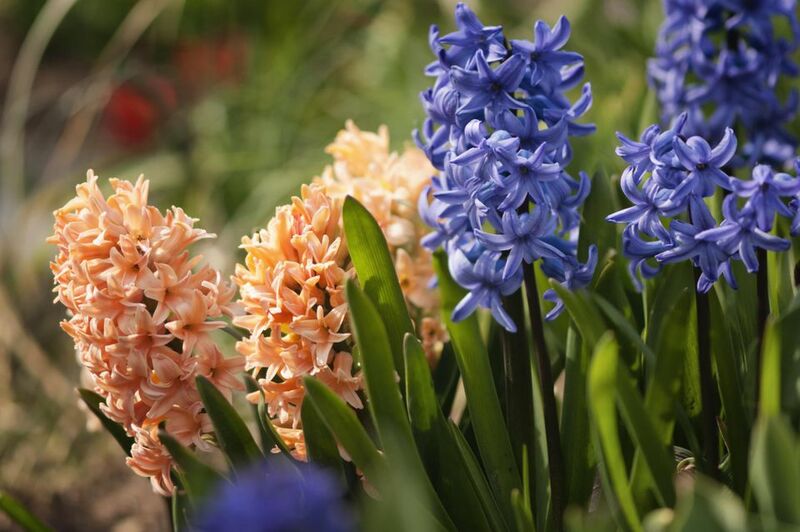 Hyacinth also mix well with any of the spring-blooming bulbs, since they come in so many colors and sizes. Their spiky flower stalks make a nice counterpoint to cup-shaped tulips and ruffled daffodils. The smaller Roman and Mutiflora cultivars of hyacinth look a bit more natural and can be used in woodland settings or along walkways. Most varieties of hyacinth bulbs are fairly large. Plant them pointed-end up, about three times as deep as they are wide. For most varieties, this will be 7 to 8 inches deep, although they can be planted less deeply in warmer climates. Give them some room to spread out by spacing them about 5 to 6 inches apart. Some of the taller varieties will flop. You can stake them if you only have a few. Otherwise, consider planting them closer together so that they support one another. Once the bulbs have finished blooming, cut off the flower stalks to encourage the plants to store energy in their bulbs. Alternatively, you can run your hand up the stalk and knock off the flowers so that they cannot go to seed. Don't remove the leaves until they have started to turn yellow. All kinds of rodents will munch on hyacinth bulbs. You can protect them somewhat by throwing a handful of gravel into the planting hole, or you can try commercial rodent deterrents. An easier method is to interplant them with daffodils, which rodents tend to avoid. Plant your hyacinth bulbs in full sun to partial shade. As with all spring bulbs, hyacinths sprout, bloom, and start to fade into dormancy before deciduous trees fully leaf out, so you don't have to worry about too much shade from nearby trees. Hyacinth are early bloomers that bloom in late winter or early spring, depending on your hardiness zone. Hyacinth bulbs are not particular about soil pH, but they do best in a soil that is neutral to slightly acidic. They will not tolerate wet soils. Rich soil can lead to floppy hyacinth, so go easy on the organic matter when preparing or amending the soil. Water the ground well after you plant the bulbs. Continue watering into winter, if there is no regular rain, but allow the ground to dry out between watering. If the bulbs sit in cool, wet soil, they will eventually rot. Hyacinth can be expected to survive the winter in USDA plant hardiness zones 3 through 9. They may need some winter protection in zones lower than 5, and some pre-chilling in zones above 7, depending on the variety. Unfortunately, hyacinths are short-lived and will probably last only three or four years. Hyacinth bulbs need a chilling period in order to bloom. In most areas, the ground gets cold enough to chill the bulbs, but if you live in a warm area and want your hyacinths to bloom again, you may have to dig up the bulbs and chill them. The easiest way to feed new bulbs is to toss some bulb food into the hole at planting time. There are many fertilizers available for feeding bulbs, or you can use ordinary bone meal. Feed the bulbs each spring when the new growth first appears by scratching some bulb food into the nearby soil and watering well. Hyacinth bulbs don't usually live for more than about three or four years. If you'd like to propagate more hyacinth bulbs, wait until late summer and gently lift the bulbs. Remove the small offsets forming around the edges of the bulbs, and replant everything, including the original bulbs. Be patient, because it will take a few years for the offsets to bloom. Since the plants can disappear in mid-summer, mark their locations while they're still in bloom. Hyacinth bulbs contain oxalic acide, which can cause an itchy skin reaction in some people. If you are sensitive, wear gloves when handling the bulbs. Oxalic acid is also toxic when eaten, so seek care for humans or pets that eat the bulbs. When planting in pots, the bulbs can be spaced more closely than when planting in the ground because the bulbs won't need room to multiply. You can squeeze them in so they are almost touching, but leave room for some soil to hold water. Keep the soil damp but not soaking wet until the bulbs sprout. Then, water whenever the soil dries out. Once the bulbs have sprouted, move them to indirect sunlight. Cool temperatures will keep them in bloom longer. If you are potting hyacinth indoors for forcing early blooms, you will either need to purchase pre-chilled bulbs or pre-chill them yourself.